One of the most common questions people ask me when I tell them I chase storms is: “How close have you been to a tornado?”. Up until now, my answer has been “I have been underneath one“, but I think I need to update that answer after Saturday’s events. Day 2 was our first real chase day and the season really started with a bang! We knew the week would be great but Saturday was supposed to be a slow start but it turned out to be one of my best chase days ever! Our target of the day was south-west Kansas and we set off to Scott City. We had lunch at Subway’s where I bumped into Scott McPartland and Dave Lewison (who took the photo picturing the tornado that used to be my “closest to a tornado”-record). I also met George Kourounis in the same tiny Subway who updated me on some of his amazing adventure stories, like standing next to a lava lake in Kongo. I love the fact that you stop in “random” places and meet up with people you know all over Tornado Alley. We all preferred to wait for the storms out on a field so we went outside of town and waited. The cumulus sure took their sweet time to come which gave me a suntan while waiting under the blue skies. We had surface winds of something around 20 mph which almost made it feel like we were already in a storm. Crazy! We regrouped to a rest stop where I saw a familiar car with a hail cage coming in. David! David is my chase partner from last year and although I knew he would chase in the vicinity it was a neat coincidence that he, and his crew, ended up in exactly the same spot. 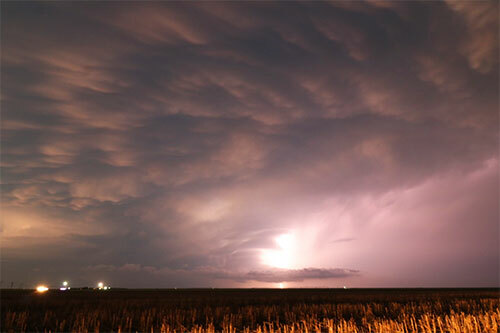 The storms were struggling and I lost faith in that we would actually see something until one finally started to get organized and quickly turned into a great supercell. The chase was on! The storm was absolutely stunning already from the start, the structure of it was just amazing and it felt like it would drop a tornado any second. In fact, it did, and we missed it – at least to the point that we could not directly see it from the point we were at and we had a really good view, but it was brief (30 seconds), low contrast and behind a rain curtain. 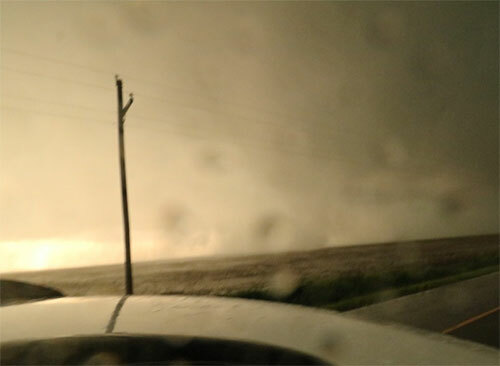 According to the reported timestamp of the first tornado, this is likely the funnel or the top part of the tornado as it was occuring (see just below the wall cloud, right of the rain curtain). 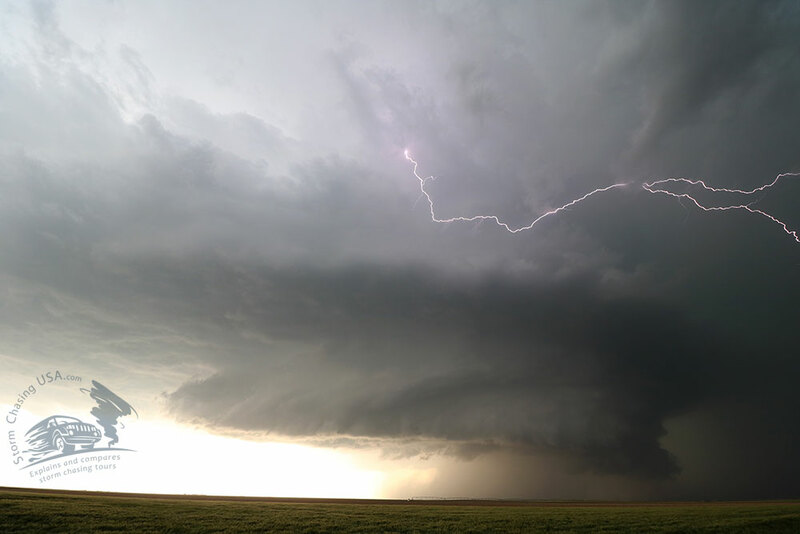 The AMAZING structure of the Leoti, KS, supercell. I lucked out by getting a lightning in this shot. 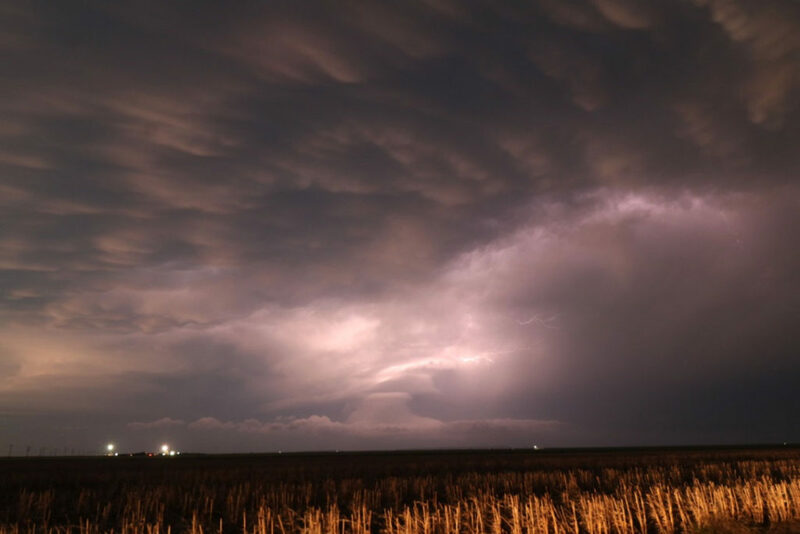 We regrouped from our structure view to get closer into the base in order to see potential tornadoes better…and got more than we bargained for! While chasing inside the bear’s cage Erik suddenly shouted “Tornado!” but from my side in the car I could not see anything – well, I saw something but I could not tell it was a tornado really. 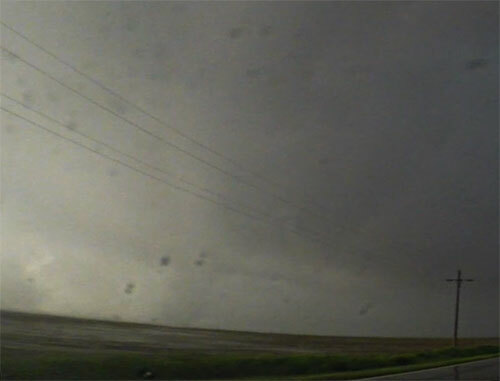 Screen grap from my GoPro dashcam where you can see the tornado. 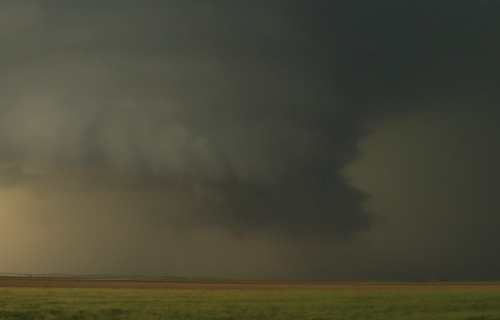 Bare in mind that this is highly wide-angle and this tornado was far closer than it seems. The tornado was coming closer and we stopped to let it pass in front. I quickly (2-3 seconds at most) got out to shoot the tornado only to realize it had changed its path and was coming right at us. Erik was shouting “We need to go!” and I was back in my seat in milliseconds and we raised away. At that point I could see the circulation on the ground just outside of us and it was really, really close. Less than 100 yards! 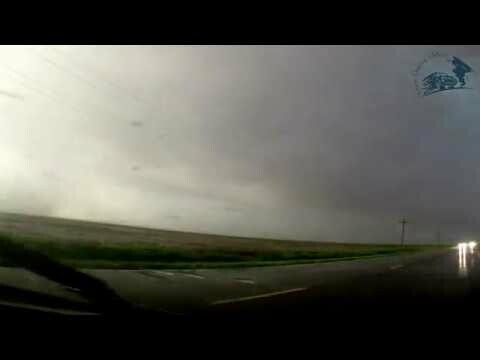 Erik slammed the gas pedal and drove off as I filmed the tornado passing just behind us! The tornado was merely a spin-up and was dissipating while it was approaching us only to die off a few seconds after. It would not have made any significant damage to us but it was still an incredible adrenalin rush! Off course, it was too close for comfort and nothing we planned to do although Erik and I were well aware of the risk. 61 year old tour guest Dave was a little bit more concerned about the safety aspects of it though. The shot I took while hanging out of the car. It is rather crappy, especially due to the rain drops, but there was no time to be picky at this moment. We continued north only to get our south escape route trapped by a truck who had decided to turn around on this little highway resulting in a perfect block on the road. Our east route was a muddy road we did NOT want to go to and north was the mesocyclone and hail core. 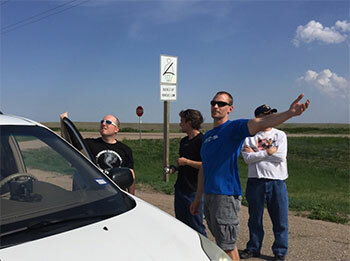 We stood in that intersection with 4-5 other vans (including Charles Edwards Cloud 9 tours and, off course, Scott McPartland and his friends – it’s a small chase world). At that point we started seeing some intense rotation just to our north and I had no doubt the storm would produce a tornado just to the field north of us but it never did. High on adrenaline I was actually a bit dissapointed but it was probably for the best. The storm started to dissipate a bit as the sun was setting so we went south again to shoot lightning and more structure shots. The storm kept on delivering in terms of beauty when the sun was shining on the most amazing mammatus fields I had ever seen. 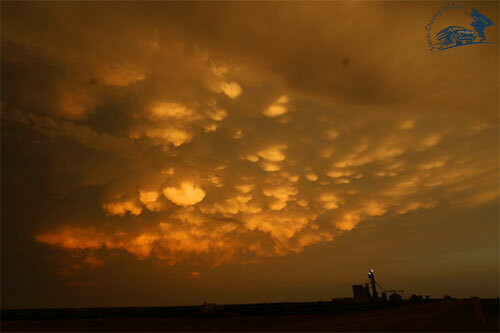 Fantastic mammatus clouds lit up by the sunset. This just blows my mind! 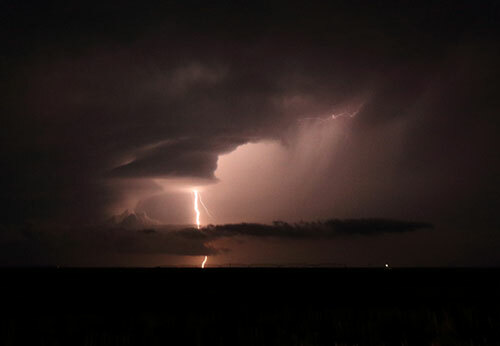 We photographed lightning for some 30 minutes and then called it a day. And, what a day!